Beer O'Clock on Tour has left the land of Efes (Turkey) and headed across the border less traveled to Georgia. Not only was the country absolutely stunning, the beer range available was much much more extensive than in Turkey. The first thing I noticed about beer in Georgia is that the advertising was just everywhere. The drive from the airport probably took about half an hour and for at least 25 minutes of that drive, somewhere in your field of vision was a Natakhtari sign. The second thing I noticed was how cheap beer was! I bought the selection below from two little stores for only 15 Lari, around $9 including some doubles! Despite the incredibly cheap prices, never pay more than 2 Lari for a bottled beer, the beer was all surprisingly good. Again it was a selection of almost all lagers although in Georgia there was also a wheat beer produced and a fruit beer that was surprisingly good. I would imagine that the competition between breweries might have something to do with this, Turkey take note! Pictured left is a tap Natakhtari, by far the most popular beer in Georgia. Thankfully for me this is a much better lager than Efes and is indeed very drinkable. On a world scale it would compete relatively well with other macro lagers, I think importers should look at this beer due to how cheap it is sold for in Georgia there's profit to be made here... It may well be a macro lager but there are certainly worse beers out there. The beer most accessible to many drinkers will be Germanuli (pictured right). Despite being most commonly served in a plastic (PET) bottle it was the beer most similar to Western tastes. A lager "made in the German style" and with numerous references, including the name, to being made with a German recipe. It uses hops liberally for a lager and is actually quite a bitter Pilsner. As regular readers would know I fully reviewed Mtieli (see review here) the other day as the beer I best thought encapsulated Georgian beer. I also thought it was the best beer in a world dominated by very thin, light yellow lagers. It's dark golden, almost bronze, colour really stood out and it's taste was excellent. 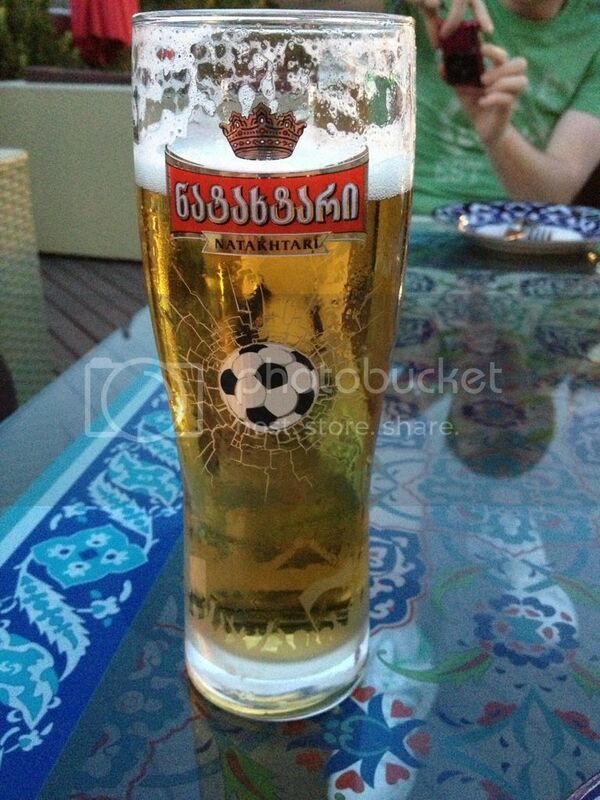 If I was to recommend a Georgian beer this would be the one. Kazbegi was the beer I was initially going to call Georgia's worst after sampling a bottle in Tbilisi. After our day trip to Kazbegi, near the Russian border (approx 170km North of Tbilisi), my tune changed completely. 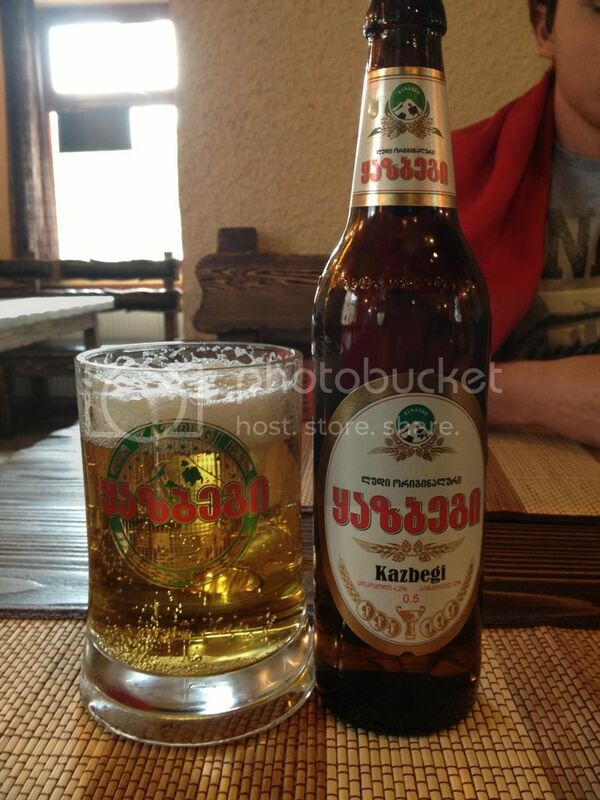 In Kazbegi the beer was a fresh clean lager, which proved to be very drinkable despite the very cold temperature outside. My advise would be to drink this only in the North of the country, I imagine that freshness is particularly important with this beer. The easiest way to bring this piece to a close, is to clump the rest of the beers as they were effectively the same. Khevsuruli was probably the best of the rest, with Zedazeni coming in next. All three of the Argo beers I tried, including one not pictured, were terrible. 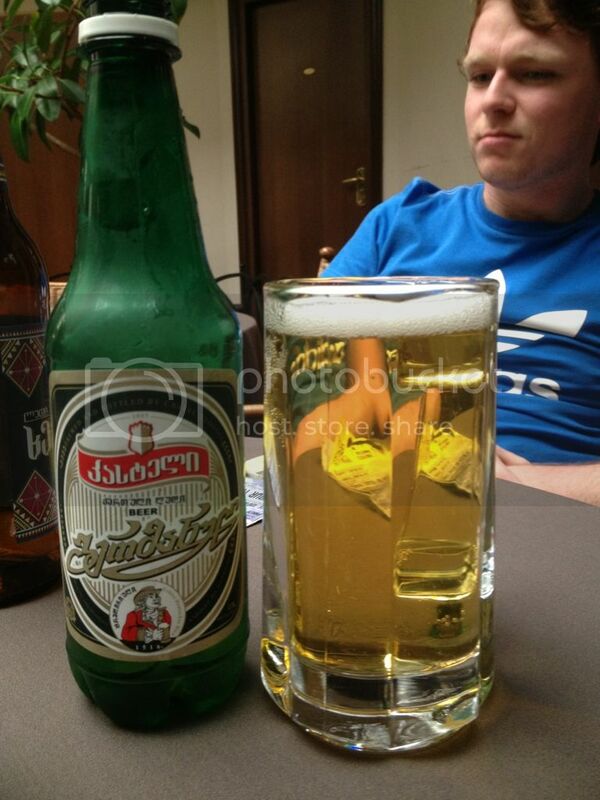 And once again the strong lager, this time Natakhtari Extra was the worst beer on offer. I could be here all day writing about average Georgian lagers but I'll call it a day here. It was pleasant to be in a country with more than just Efes products! Even if it is very hard in Georgia to find anything other than lagers, it's a welcome change to be able to find different ones! Georgia is not the country for you if you are looking for craft beers. If you don't mind drinking lager there are plenty of options out there for you. Although it may not be a beer destination, it's a country certainly worth visiting for the scenery and the cheapness. Anywhere you can get this many beers, regardless of quality, for $10 has to be good!